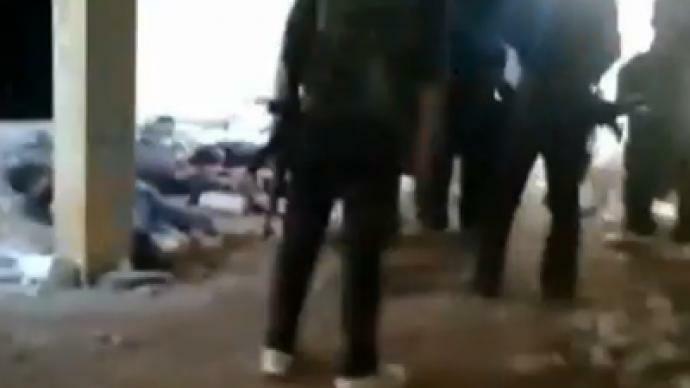 Video footage has emerged from Syria allegedly showing rebel fighters beating and kicking surrendered soldiers before shooting them dead. The UN says that if the killings are confirmed, the acts constitute a war crime. The killings took place on Thursday, during an assault by rebels in the northern town of Saraqeb – which has been the scene of heavy fighting between rebels and government forces in past weeks, according to the Syrian Observatory for Human Rights. However, the video cannot be independently verified. Rebels are now in full control of the town, after regime troops pulled back during Thursday's fighting, the observatory said. The YouTube video, shows around ten armed men in what looks to be a building under construction. In the footage they surround a group of captured men on the ground, some of whom are in Syrian military uniforms. Some of the men are lying on their stomachs, while others are sprawled out as if they are injured. 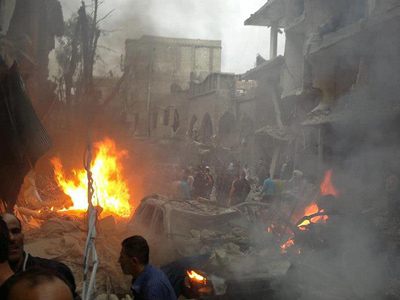 One of the men can be heard saying, “These are Assad’s dogs,” in the background. Another says, “Damn you,” as the gunmen kick and beat some of the men. Seconds later, screaming is heard simultaneously with gunfire, which erupts for about 35 seconds. The men on the floor are seen twitching and shaking, presumably from being shot. “I’m not sure of the identity of these people, but this is a war crime in any event. Shooting people after they surrender and especially if they are army people is a war crime in law – both domestic and international – and I think this should be viewed in that light,” President of the Arab Lawyers Association, Sabah al-Mukhtar, told RT. Amnesty International and the UN High Commissioner for Human Rights say they are trying to confirm the video’s authenticity and determine the identity of those responsible. “The allegations are that these were soldiers who were no longer combatants and therefore, at this point, it looks very like a war crime,” spokesman for the UN High Commissioner for Human Rights, Rupert Colville, said in a statement. 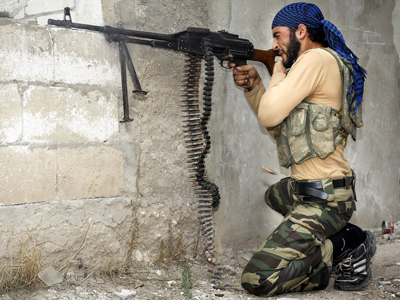 Even the country’s main opposition group, the Syrian National Council (SNC), says that if rebel fighters are indeed responsible for the execution, then they should be held accountable for their actions. 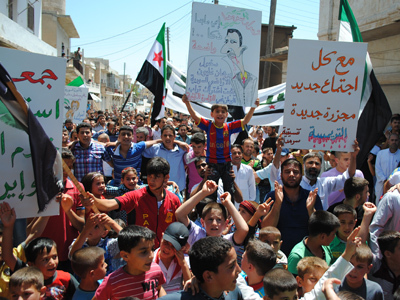 “We urge the (rebel) Free Syrian Army and the revolutionary movement on the ground to hold to account anyone who violates human rights,” SNC human rights committee head Radif Mustafa told AFP. But if the gunmen are identified, many have little hope that the guilty parties will ever be brought to justice. “The western world which created the International Court of Justice doesn’t want it to operate except when they want it to. It didn’t happen in Libya, it didn’t happen in the crimes that were committed in Iraq or Afghanistan, and it’s not likely to happen in Syria because most of these campaigns are being backed by western powers, in particular NATO, the USA, and France,” al Mukhtar said. What’s worse is that this is not the first report of human rights abuses committed by armed rebels. “Every day, these so-called rebels supported by NATO and the GCC countries are performing killings of this type. In this case, [the men] are being shot by guns but in other cases, they kill them with knives, slitting their throats and performing unspeakable acts on some of their prisoners. This form of brutality is part of the mentality of these rebels…they are anti-humanistic,” political analyst Dr. Ibrahim Alloush told RT. The video comes just after Washington called for a re-shaping of the opposition’s leadership so it could better represent those fighting on the frontlines. 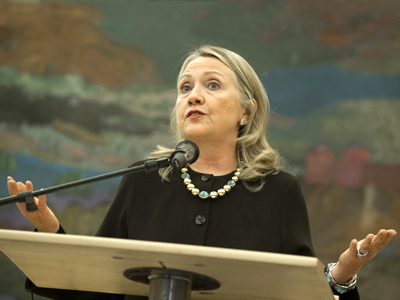 On Wednesday, US Secretary of State Hillary Clinton made clear that the SNC should no longer play a large role in the opposition’s leadership. 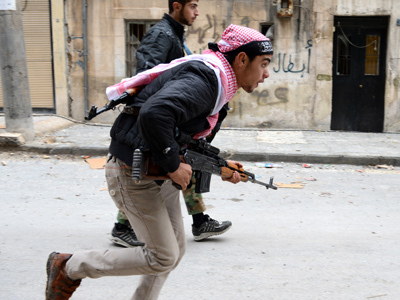 The Syrian opposition is composed of a variety of rebel groups, some of which have reportedly been infiltrated by Al-Qaeda linked radical Islamists. The opposition has been largely criticized for its lack of organization and unity. Clinton went on to say that the Obama administration is suggesting names and organizations that should feature in the new rebel leadership that is to come from a four-day conference in Doha, Qatar, starting on Sunday. As Washington continues to support the rebel opposition, professor and political analyst Joseph Cheng says such support will only encourage more violence. “It’s likely we’ll see more violence because it appears the American government is indicating it will support those groups which have been proven most effective in fighting the pro-government forces,” he told RT. China’s peace plan to be rejected by US? Just one day after Clinton’s speech supporting the rebel opposition, China unveiled its own four-point peace plan for Syria. The proposal calls for a ceasefire in stages and a political transition. The details of the plan have been deemed vague, it most likely won’t involve Assad stepping down – which is what the US wants. China has been against a one-sided approach since the uprising began in March 2011. Editor of the Corbett Report, James Corbett, says it’s the only real peace plan on the table – but that Washington won’t even consider approving it. “It’s a political non starter in Washington…the US is keen to see that Assad stepping down is part of any proposal and they’re not going to accept anything short of that. So I think they’re content to watch these atrocities and murders and executions and tortures pile up in the name of trying to get rid of Assad. And unfortunately the only real peace plan on the table at the moment isn’t even being considered seriously by Washington,” he told RT.